Stephon Smith believes that local produce should be available all year round, and is on track to do just that by providing Missoula with its first urban aquaponics farm. Locavore Produce uses aquaponics, a type of farming that uses fish and a Chinese-style greenhouse to produce plants. It grows plants more densely and quickly while using one-tenth the water than conventional agriculture. Smith’s parents were part of a food education group in Boulder, Colorado, where they learned the city was dependent of food imports. In fact, most of the food grown on land surrounding Boulder was exported. “I’ve always had an interest in trying to be part of some type of solution that creates food locally so that it can be consumed locally,” he said. Aquaponics uses a system of running water underneath suspended rafts of plants. Fish live in segregated tanks within the water; their waste contains microbes that convert it into fertilizer for the plants. The vegetables’ roots help filter the water, which is then cycled back to the fish. The Chinese-style greenhouse reduces light transmission and focuses on heat retention, which is healthy for both the plants and the fish. The farm uses no pesticides and is an easy and efficient way to harvest crops. Smith’s design was bought from Susanne Friend and Tim Mann of Friendly Aquaponics, who developed and certified the aquaponics system in 2008. It’s different from hydroponics, a system that grows plants out of a water medium. Smith said that other cities, including those in northern states, have used aquaponics to successfully grow plants. Smith and business partner Matt Runge started developing the greenhouse in April 2018, and after some trial and error sold their first harvest of lettuce and chard in January. During the first week of February, they sold about 80 different leafy greens at the Missoula Senior Center. They plan to grow spinach, kale, arugula, parsley and other herbs in the future, along with other fruiting plants like tomatoes in the summer for the Missoula Farmers Market. Right now, the greenhouse is located on 1,200 square feet of land at the Missoula Urban Demonstration Project, or MUD. In the future, Smith hopes to expand and provide a large enough production of vegetables that he can start a subscription service. Incorporating sustainable ways to power the farm, using a more resilient species of fish and growing their own fish food are other goals. 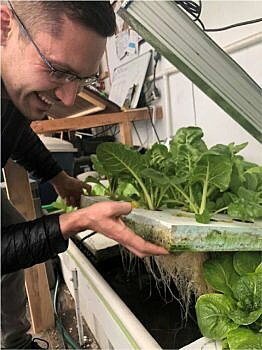 “Aquaponics is a nice middle point where you’re using natural ecosystem principles but with controls in a nice box that you can manipulate, but only so much,” Smith said. Smith will sell produce at the Missoula Senior Center every Saturday from 9 a.m. to 1 p.m. The money raised will go toward repaying loans and ramping up springtime production.